With NBCUniversal’s help, the struggling social media giant preps more than a dozen original series for its 188 million users as it muscles into a crowded market. If the vertical framing on the monitors didn’t give it away, Yoonessi’s direction for the snappy take does: The series is one of more than a dozen serialized shortform shows that Snapchat will begin rolling out under its new Originals banner on Oct. 10. Snapchat signaled plans to bolster entertainment programming on its platform nearly a year ago when it announced that it had formed a joint venture with NBCUniversal to develop and produce scripted shows from creative talent including Mark and Jay Duplass. Now, after a redesign that drew the ire of many users and stalled audience growth on the platform, Snapchat is rolling out Originals at a pivotal moment. In addition to Dead Girls, which hails from Keshet and digital studio Insurrection, scripted programming in the works includes mystery Class of Lies from Riverdale writer Tessa Leigh Williams and executive producer Mark Boal and, from the Duplass’ DBP Donut studio, a queer college coming-of-age comedy, Co-Ed, and the stalker thriller Slay. There’s also a slate of docuseries featuring rapper/internet star Bhad Bhabie and a group of daredevils known as the Stunt Brothers. Snap head of original content Sean Mills says the projects are geared to the 18-to-24 demo that has shown an affinity for the slate of some 60 partner-produced original Snapchat Shows the company has released. “This is an audience that’s very challenging to reach on other platforms,” he says. “The mobile screen is the first screen for that generation, and they’re spending a lot more time on our shows than ever before.” Of those existing shows, he says, 18 have monthly audiences of more than 10 million unique viewers. 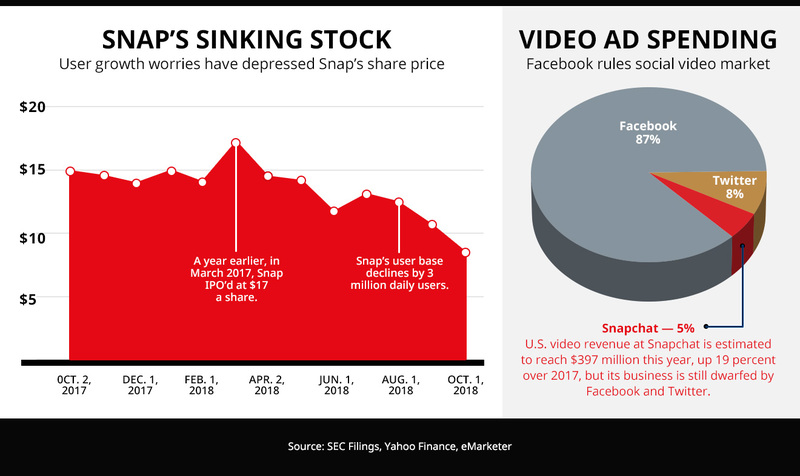 But the scripted launch is coming amid questions about whether Snap has lost its cool with its core base, especially after a February redesign that prompted complaints. During the second quarter of 2018, Snapchat’s daily average user base shrank by 3 million to 188 million. The stock swiftly dropped and has yet to recover, trading down 50 percent, at all-time lows, since the start of the year. “No one should have crazy expectations about how big that user base can be,” notes Pivotal analyst Brian Wieser. Tasked with making sure much of Snapchat’s content resonates with users is Indigo, the joint venture of Snap and NBCU that also serves as the studio on five shows from the Originals launch slate. Indigo, formed after NBCU invested $500 million in Snap’s IPO and run by NBC veteran Lauren Anderson, also is a kind of middle man, helping to convey Snapchat’s mobile video format to partners without getting in the way of the creative process — a frustration for some when Snapchat first started to launch shows. Because the Duplass brothers are known for producing shows on the cheap, they were able to explore a lot of ideas before they settled on the projects that will debut on Snapchat. But that might not always be the case, with one agent noting that Snapchat’s lower budgets could limit its access to creative partners, especially as Jeffrey Katzenberg’s NewTV begins to throw premium TV money at the shortform space.